Slip-on baby shoes are soft and flexible for tiny little feet. Sneakers have elastic on top to help the shoes stay on. Sneakers can be worn with a variety of outfits. 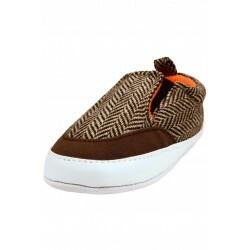 Soft sole baby shoes are made out of soft breathable fabrics. Shoes can be worn with or without socks.